What a fabulous Friday, there’s so much to share today. Firstly I need to update you about the team. Sadly our lovely Candy had to step away from being a Creative Guide and we are already missing her wonderfully creative projects in our challenge line-ups and also our dear Trace needs a bit of time to work with other things at the moment so will not be sharing her unique style and fabulous projects with us for a while. But I am pleased to tell you that we have chosen two very special people to join us and enable us to continue to share some incredibly original and imaginative works of art with you. So I am very pleased introduce the two new Creative Guides - Julie Lavalette from Juliz Design Post and Julia Aston from Create With Me who both will be an asset when sharing projects in the challenges and sharing their ideas. You can see their bios and photos in the Creative Guide page on the sidebar. Moving on I would now like to introduce Jill Wakefield aka as Tocoart as our guest winner today and when you’ve seen Jill's fabulous project you will be able to scroll down and see the winner and pinworthies of the last challenge. 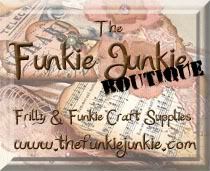 Hello My name is Jill Wakefield and I am very honoured to be allowed to have something feature on Vintage Journey! 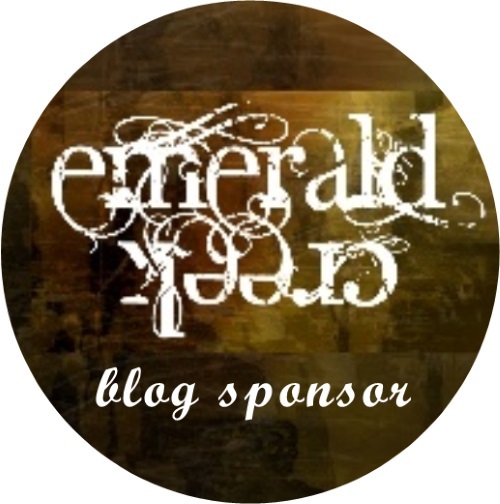 I am very new to blog land only joining the community in May of this year. 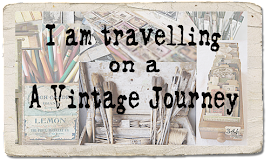 One of the first that I found was Vintage Journey and it was right up my street. Being a “collector” of all things Tim I was in heaven. I live alone with my 19 Year old daughter and our small zoo of domestic animals. I have always liked to make things, I remember getting very frustrated with Blue Peter as a child as I never had any double sided tape! I have knitted, but never got the hang of crochet, then like many people probably I got myself sky television and discovered craft…… and the spending began! QVC was where I first discovered Tim Holtz and his tags. My Favourite thing about his work, is his use of colour and how he combines them in his creations. For the theme Heavy Metal I decided to Alter a bottle I had been hanging on to. Solid, heavy glass it was far to good to through away. This is what it looked like to start with. Firstly I placed on the bottle some clear plastic envelope seals. Purchased from the pound shop. I then covered the bottle with acrylic gesso, using a sponge, it had 3 coats in total to look like this. Leave to dry naturally as a heat tool will blister the acrylic gesso and the plastic circles. Leave the plastic seals in place for the time being. To colour the bottle I used 3 shades of Luminart Paints again applied with a sponge and blended by dabbing with a wet wipe. This is only 1 coat but you can of course do more. I then stamped over the bottle using a large background stamp. This particular one is called bubble border. I used black archival for this and I very carefully gave it a waft the the heat gun to ensure it had set. At this point I also sprayed the bottle with some Winsor and Newton Satin spray varnish. I do not use hairspray, your materials cost you a lot of money and you invest a lot of hours on your work. Hairspray has chemicals in that are not suitable for long term use on your art. They don’t have the UV and UVA filters that protect your work from light fading either. Your work does deserve the best! When the stamping is dry you can take of the plastic seals and we have some beautiful little portholes. I chose to create some flowers for my little vase and to do this I used Ranger Metal foil Tape Sheets. They are self adhesive and super easy to use. I stuck the sheet onto card and coloured with alcohol inks, using a blending tool and felt, 1 felt for each colour. Thank you so much Jill for sharing this wonderful project with us, it is full of wonderful colour and shapes. You have certainly used some great techniques in getting together all the elements you have added to alter this bottle into something completely different. It is a wonderful transformation. Now we share the winner and pinworthy mentions from the last challenge and it’s over to Astrid to share this with us. I would like to start by saying a big thank you to everyone who took part in the Colours of Autumn challenge. What a wonderful array of projects, it was clear to see, that so many of us get inspired by the amazing colours nature provides us with at this time of year! So thank you for travelling with us once again or for some of you for the first time. I loved Mona’s wonderful lay out the moment I first saw it, the subtlety of the colours she chose, the amazing textures, both on the background and on some of the embellishments like the leaves, the whole composition of the lay out, just captured my heart. This is just stunning, and if you have not seen it all yet, check it out. Mona your voucher will be on it’s way soon and your project will be pinned to our winners board. Nicole put together the most amazing piece of Halloween inspired home décor, it just oozes creativity and attention to detail. I loved the combination of stamping and die cuts on this piece, and such wonderful autumnal colours, bright and subtle in perfect combination. All these amazing creations will be added to our Pinworthies board. Thank you to all who played along, we all hope you will join us for many more challenges to come. Don’t forget there is still a week left to get on your metal and play in our latest challenge. Oh wow you guys thank you so much for the Pinworthy shout out. Now to find your board. It's been awhile as some of you may have noticed since I've been crafting. So this is a real treat for me. Sad some of my favorite guides are moving on. But I'm excited to see some fresh craftiness and play along. Congrats to all the winners and thank you Jill for a fabulous project. Thanks for sharing with us,\. Big congrats to all the winners and a huge welcome to Julia and Julie!! So sad about Candy, she will be much missed and all the very best to Trace with her 'time out'. A huge welcome to the wonderful Julie and Julia, thrilled to have you travelling with us! Jill's project is stunning, there are some great tips too. Congratulations to our winner Mona for her gorgeous piece and to Nicole, Suzanne and Jann on being Pinworthies. Jill what a stunning colourful project and I love your little portholes in the glass. Congrats also to all the worthy winners. Thanks so much to the Creative Guides for choosing me to travel on this journey with you all and a warm welcome and congrats to Julia as well. All the layering and the colors!! Just fabulous. Wonderful! I've been a fan of Julia Aston's for a while. Looking forward to seeing her here too! So sorry to see the awesome Candy go and wishing lovely Trace well during her 'leave of absence'. Huge congratulations to Julie and Julia - looking forward to your future makes, I'm sure you'll not disappoint. Stunning project from Jill - congratulations on being feautured as guest designer. Well done to victorious Mona - well deserved win. Terrific work by the pinworthies too. Golly lots going on here!! Sorry to Candy step down ~ sure will miss her fab creations and wishing Trace all the best with her leave of absence. Congrats to the new team members! Beautiful inspiration project from Jill! Love the beautiful flower arrangement! Congrats to all ~ so many amazing projects! Thank you so much for featuring my layout! I'm so honored and thrilled! Looking forward to the upcoming challenges!